Description: Charismatic Classics. Our God is the God of impossible circumstances, but He expects us to do our part and pray. In this book, Buddy Harrison shares from his life experiences how he petitioned the Lord through prayer and saw God move in his behalf. Harrison says, "It's not enough to know what to pray for -- we must know how to pray." Harrison effectively explains that different needs require different types of prayer, and each has it's own guidelines. 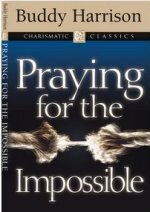 Praying for the Impossible contains solid, biblical teaching on the prayer of supplication and how readers can petition the Lord on their behalf. Previously Petitioning for the Impossible. Praying for the Impossible was the first book I read by Buddy Harrison. I enjoyed it a lot - he has a great testimony and the personal experiences of God's goodness in the book will definitely uplift your spirit like it did mine!